Novelist Alice McDermott never lived in Brooklyn, N.Y., but that’s where her family landed after immigrating from Ireland. She grew up listening to their stories of a pre-war Brooklyn that made it seem like an enchanted isle. The brownstones of that earlier, more romantic era provide the setting for McDermott’s latest novel, her first in seven years. It’s a portrait of the sort of character often overlooked in literature — an ordinary woman — neither special nor heroic, just concerned with the matters of family, community and the heart. “The poetry of the every day,” is a phrase often used to describe Alice McDermott’s novels, and she joins guest host Tom Gjelten to discuss her latest book. Alice McDermott Author of six previous novels, including the National Book Award-winning "Charming Billy." Excerpt from “Someone” by Alice McDermott. Copyright 2013 by Alice McDermott. Reprinted here by permission of Farrar, Straus and Giroux. All rights reserved. MR. TOM GJELTENThank for joining us. I'm Tom Gjelten of NPR sitting in for Diane Rehm. She's on vacation. Someone, anybody, a person unknown, or someone as in, I want to be someone, a person of importance. And "Someone" is the title of award-winning author Alice McDermott's latest novel set in Brooklyn between the wars. An Irish-American woman reflects on the touchstones of what on the surface appears to be an unremarkable life. Alice McDermott joins me in the studio. Hello, Alice. Great to have you hear. MS. ALICE MCDERMOTTThanks so much for having me. GJELTENYou bet. And I know a lot of you are Alice McDermott fans. You can join our conversation if you call 1-800-433-8850. You can send us an email, drshow@wamu.org. You can send us a tweet @drshow, or you can join us on Facebook. So Alice, I just said that your book is about a woman who on the surface appears to have an unremarkable life. Do you have an quarrel with that characterization of your main character, Marie? MCDERMOTTYou know, before this book was final, I mentioned to my editor that I'm going to hear a lot of this ordinary people, and oh, another story about another ordinary person. And he said to me, well, then you just have to stop writing about ordinary people. Yes. This is a story of an unremarkable woman, and a more or less ordinary life, although I suspect that there are very few of us who, looking at our own lives, would insist that they are ordinary lives. MCDERMOTTBut much of my point here, I think, and one of the things I wanted to achieve starting out, was to give voice to a character who in her own life, and in literature, is not often given voice. GJELTENWell, that's really a noble thought, but as an author who has to hold the interest of your readers, does that mean that you are not -- you don't need suspense, you don't drama, you don't need conflict? How do you as an author who has already a really wide following, how do you mange to pull that off? MCDERMOTTWell, that's the contrarian in me. Yeah. On the surface, the smart writer would say, oh, no. Don't write about this character because you're going to have to search for drama intention, and the contrarian in me said, well, then I'm going to find drama intention in the most unlikely place I can think of. And so the challenge is to take this ordinary stuff, to take this familiar-sounding life, the life of a woman across the 20th century, a middle-class, not particularly attractive, not particularly dramatic character, and find what's extraordinary in that. GJELTENCan you imagine your book being made into a movie? MCDERMOTTOh, we all imagine that at some point. GJELTEN...you know, we want to have our voice represented, you know? MCDERMOTTWell, actually, a reader has already made the suggestion which I thought was startling good, that maybe not a movie, but certainly a one-woman play, because this is very much a story of voice. This is a single woman's voice, to paraphrase John Cheever, sort of standing naked speaking into the dark telling her own story. And so maybe not Hollywood, but perhaps Broadway would be interested. GJELTENOkay. Your main character is Marie Commodore (sp? ), and she is, as we said in the intro, an Irish-American woman living in Brooklyn. Tell us how that connects to your own life. MCDERMOTTWell, I grew up on Long Island. Both my parents were first generation. My grandparents were all born in Ireland. My mother grew up in Brooklyn. My father grew up in Brooklyn and Manhattan, and all my relatives were from that area. So I never lived in Brooklyn, but visited there a lot, and what was more important to me as a writer was I have in my head the language of that time and place. Not just the language of Brooklyn, but the language of that generation. MCDERMOTTAnd I think one of the things we all want to do when we write is to capture something that seems to be fleeting, to capture characters whose life we will not see again. So a lot of what I was trying to through Marie's voice is also to reproduce, and they're subtle differences. It's not a hard twang. It's not any kind of other language, but there are phrases and ways of looking at the world through language that belong to that generation that I wanted to in some way capture and preserve. GJELTENAnd was that time between the first and second World Wars, and that place, really important to your parent's generation such that they reflected on it a lot? I mean, did you hear them talking about it a lot, about that time and place as you were growing up? MCDERMOTTOh, certainly. Again, this was the World War II generation, so that was the touchstone, again, conversations and family gatherings, and around the dinner table. Certainly the war was touchstone. It was their coming of age for that generation. But also that sense of community, tight-knit, inner city community that perhaps they never truly reproduced with the move to the suburbs. GJELTENAll right, Alice. I'm going to read a little bit here from the first paragraph in your book. You are describing a woman, it's not Marie. It's another woman who plays a very important role, at least in the beginning of the book. She's coming out of the subway and walking home. She lives next door to Marie, and this is what you write? "She had, always, a bit of black hair along her cheek, straggling to her shoulder, her bun coming undone. She carried her purse in the lightest clasp of her fingers, down along the side of her leg, which made her seem listless and weary even as she covered the distance quickly enough, the gray sidewalk from subway to parlor floor and basement of the house next door." GJELTENNow, our readers aren't going to necessarily know what phrase in that little bit that I read was particularly important to you. Why don't you explain. GJELTENNot something we hear these days. MCDERMOTTNot something we -- even parlor, the word parlor. Who says parlor anymore? But for my parents' generation, living in brownstones, just if you know the architecture of the brownstone, the street level would be the basement entrance and then up those beautiful staircases to what they called the parlor floor. 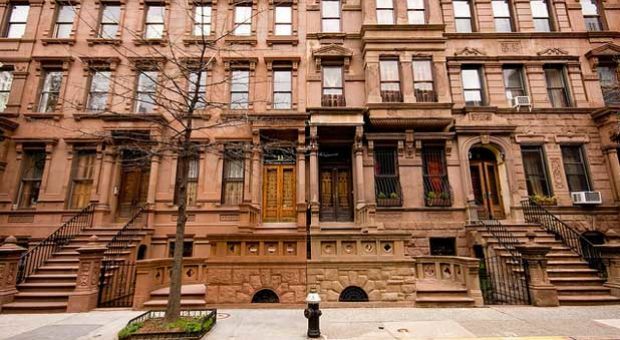 And for this immigrant generation, when the brownstones had been broken up into apartments, there would be sort of a duplex apartment which would be referred to as parlor floor and basement. MCDERMOTTOh, they live in the parlor floor and basement. And, you know, just that refrain stayed with me, and I found myself thinking about, and sort of drawing out meaning from that. The idea of parlor floor, the place that's untouched where the good furniture is, and the good rug, and you only use it when visitors come. Again, all of that sort of immigrant propriety, a parlor, and then basement. That's where kitchen is, and that's where the family really lives. MCDERMOTTAnd negotiating the two, and especially for a first generation family aspiring to be WASPs and real Americans. Just negotiating that -- the homely, the hard-working, the stuff of family life, and then the stuff that you want to show to society. So that phrase became a kind of refrain, and even a metaphor that I found myself sort of drawing out. GJELTENThat's fascinating. And why don't you continue with your book from that point on. Marie sitting there watching this woman come home. MCDERMOTTRight. And Pegeen is the young woman. MCDERMOTT"I was on the stoop of my own house, waiting for my father. Pegeen paused to say hello. She was not a pretty girl particularly; there was a narrowness to her eyes and a wideness to her jaw, crooked teeth, wild eyebrows, and a faint mustache. She had her Syrian father's thick dark hair, but also the permanent scattered flush, just under the fair skin, of her Irish mother's broad cheeks. She had a job in lower Manhattan in this, her first year out of Manual Training, and, she said, she didn't like the people there. She didn't like a single one of them. She ran a bare hand along the stone balustrade above my head. MCDERMOTT"The other, which lightly held the strap of her purse, wore a dove-gray glove. She had lost its partner somewhere, she said, and laughed with her crooked teeth. Fourth pair this month, she said. And left the library book she was reading on the subway yesterday. And look, tore her stocking on something. She lifted her black shoe to the step where I sat and pulled back the long coat and the skirt. I saw the laddered run, the flesh of Pegeen's thin and dark-haired calf pressing through between each rung. MCDERMOTT"The nail of the finger Pegeen ran over its length was bitten down to nothing, but the movement of her hand along the tear was gentle and conciliatory. A kind of sympathy for her own flesh, which I imitated, brushing my own hand along the unbroken silk of Pegeen's stocking, and then over the torn threads of the run. Amadan, Pegeen said, that's me. That's what I am. GJELTENAlice McDermott reading from her new novel, "Someone." Amadan. MCDERMOTTAmadan is the word -- the Irish word for fool, and again, it became a kind of refrain as I was coming the novel that Pegeen is clumsy and is falling always, and her mother being Irish born has referred to her as Amadan, fool. Little Marie, this is the first she's heard this word, and she's only seven years old, but just a few days later, Pegeen has met with an unfortunate end and Marie's brother who is bound for the priesthood reads from the Bible for Marie's parents the quote from Matthew about a sparrow falling and even the hairs of our head are counted, so do not be afraid. MCDERMOTTAnd Pegeen sort of -- Marie, sort of feeling jealous of the attention that her brother gets, responds by saying Amadan to him. GJELTENAlice McDermott. Stay tuned, we'll be right back after a short break. GJELTENWelcome back. I'm Tom Gjelten, sitting in for Diane Rehm. And my guest today is Alice McDermott. Her new novel is called, "Someone." She is the author of six previous novels, including "After This," "Child of My Heart," "Charming Billy," which won the 1998 National Book Award and "Weddings and Wakes," "That Night" and "A Bigamist's Daughter." So, Alice, we were just talking about Pegeen and what she was saying to Marie in this opening scene of your book. GJELTENAnd something else, something that Pegeen says there when she's talking about when she falls and someone helps her up. She says: Someone nice always helps her up. That, too, is a very important idea. And the title of your book is, "Someone." Why don't you explain that? MCDERMOTTYes. Well, again, it's that recurring theme that as I was composing the book began to reveal itself. And Pegeen, with this habit of falling that she has in her clumsiness or perhaps it's something else, does find that even in Brooklyn and in lower Manhattan, which is an awful place for people in Brooklyn, that someone appears to help her. When Gabe, Marie's brother, in trying to offer comfort to her parents, quotes about the, are not two sparrows sold for a small coin. MCDERMOTTAnd Marie says, amandan fool to say such a thing. Her brother turns to her father and says, it means someone's a fool. And so there I had, as I was composing the novel, again this balance and some way it's reflected of that parlor floor, the stuff we show the world and basement. And the very notion that someone cares, that we're not alone is that true. Marie doubts it even as a seven-year-old and her brother believes it fully as a young man. And that tension plays out throughout the novel. GJELTENAnd her brother says to her when Marie is wondering whether any man will ever come along. He says, someone will. MCDERMOTTSomeone will. Yeah, she has a heartbreak at 17, a cruel break-up and her brother is there to offer what he can. And she asked him, you know, who's going to love me as most 17-year-olds in great despair might. And all he can say is someone, someone will. GJELTENAnd you titled your book, "Someone." It's actually a very abstract kind of title, isn't it? The way that you are describing it. MCDERMOTTYes. Yeah. Well, for a long time it was, you know, it was the working title. And I kept thinking, oh, I've got to come up with something sexier than that, you know? Surely, I will have a brainstorm and something much more intriguing and literary and complex. But, again, the more the novel revealed itself to me, the more I saw how this was indeed a refrain. And in its simplicity, essential to what the story was about. GJELTENNow some of our listeners might remember the heroine, Marie Comerford (sp?) from a short story you wrote and was published last year in "The New Yorker." But one change between that short story and this book is that "The New Yorker" story, you wrote it in the third person. GJELTENAnd in this -- in the novel, the final version of your novel, you've given Marie her own voice. MCDERMOTTYes, yeah. Yeah, this is probably the kind of craft matter that fiction writers love to talk about and most readers are, like, so what's the difference? GJELTENWell, here's a chance to say why it's important. MCDERMOTTYes. Well, it's -- most of the novel was composed in the third person. And of course anyone who teaches writing always runs into going against your own rules. And for years I told my students who were suffering over do I write this in first person or close third person? And I would say, oh, for heaven's sakes, it doesn't make that much difference. Just commit and write your story. And yet I found myself, you know, well into the novel feeling somewhat dissatisfied. MCDERMOTTSomething wasn't quite right. And I went back to some of my original intentions for the novel, and as I was saying, I wanted to capture this woman's voice, a voice that's not often heard from. A woman who was not heard much from even in her own life. She had lots of thoughts but nobody ever turned to her as they turned to her brilliant brother to ask her opinion. And I realized the third person, in some ways, was doing the same, was still taking her voice. MCDERMOTTAnd I was confiscating her voice and that I needed to give her the first person to tell the story in her own way and in her own words. GJELTENYou know, Alice, there is actually a paragraph here that really spoke to me about precisely that, the fact that she didn't feel she had a voice. And we're still hearing this initial scene where Marie is with Pegeen and Pegeen tells her the story. And then she lowers her face to Marie and says, don't you dare tell my mother. And then Marie writes: "I was seven years old. I spoke mostly to my parents, to my brother, to my teachers when I have to." GJELTEN"I gave some whispered response to Father Quinn or to Mr. Lee at the candy store when my mother poked me in the ribs. I could not imagine having a conversation with Mrs. Chehab who is red haired and very tall. Still, I promised I would say nothing." This is the voice of a very shy girl. MCDERMOTTYes, indeed. Yes, yeah. And again, a woman of her era. You know, the -- sometimes I think it's hard for us even now to understand some of the difficulties for a young woman who was not well-educated, who was in, again, a patriarchal Irish American family under the sum of a patriarchal church to find her own voice. One thing I was very aware of in trying to capture authentically the voices of these people and the voice of Marie at this time and place was not to apply that kind of present-ism that I think we tend to do. MCDERMOTTThis is not necessarily a historical novel, and yet in some way it is. It is not a time I've lived through. And so to remember -- for a woman to wear glasses in the 1930s and '40s was a great burden. Taking them off when she went out and not being able to see. GJELTENEven if she couldn't see. MCDERMOTTAnd then she couldn't see. And there's fear of falling. But -- and, you know, I think it's so easy to forget that and to forget what woman's role was. And then certainly as she gets older even still, a middle aged woman in the suburbs of that era, how little opportunity she has to speak. GJELTENYou keep using that phrase, that era and you keep saying how important it was to you to authentically represent that era. Why is it so important to you to write what you described as a historical novel? Why was that part of this enterprise so important to you? MCDERMOTTWell, you know, I go to fiction, I think, for a kind of truth that I'm not sure we can find in any other kind of writing. I love to read nonfiction. I read the paper every day. But I think that without an agenda, truth of trying to put down, to put down words, to record through language what it is to be human, think fiction is the only place where writers are free to do that. That I don't have to prove anything. MCDERMOTTAnd I start out more as, in an attempt to discover, not to convince. And so that's what drives me as a reader and so it drives me as a writer to discover what is there and not to manipulate it but to discover within it something that's true. GJELTENSomething that's true. And for that reason your characters have to real enough to be believable. But they have to be genuine. They have to be real. MCDERMOTTAbsolutely, absolutely. And you can't manipulate them, you know. I mean, the risk is to bring any kind of agenda to fiction. And then to try to make your characters behave in some way. And rather, I always tell my students, at some point, what we have to do as fiction writers is simply put ourselves at the service of our characters. And that had a lot to do with why I had to give Marie the first person voice rather than the third. MCDERMOTTTo put myself, as the author, at the service of the character and portraying her life. GJELTENAnd aside from drawing on what you remember of your parents' generation's stories, what else was required on your part as the writer in order to provide that authenticity. Did you do research? Did you go back to Brooklyn? Did you try to talk to other people? Historians? What did you do to make that historical context genuine? MCDERMOTTIn this book, it's different with every novel. But very much in this book, this was more of a diving into character rather than expanding out from character. So when I started, I thought, yes, indeed, I'm gonna have to go and have a couple of weeks in New York and walk around Brooklyn again. And then more and more, as I heard Marie's voice, I thought I'm not writing about Brooklyn, I'm writing about this one character's experience of it. MCDERMOTTSo in some ways, it's her world more than it is the world that you can find if you get on Amtrak and go up and take the subway to Brooklyn. So everything about the place has to have its own, not only sort of add to metaphor and consciousness, but it very much has to be seen through her myopia as well. So this was -- this was really a sort of delving down into the character rather than going out doing research and delivering that to the character. GJELTENWell, let's talk a little bit more about Marie Commodore, your character. You have her, at some point in your novel, working in a funeral parlor. Tell us about what she did there and, you know, what was the importance of that to the story. MCDERMOTTYes. Again, this is that sense of just pulling out that metaphor and connecting all the various events of her life. Right there in that opening scene when Pegeen says she's working in lower Manhattan and she doesn't like it. Later on, Marie's first boyfriend advises her, you don't want to go into Manhattan. Don't go into New York City. You know, stay in Brooklyn. You know, it's peaceful here. MCDERMOTTSo because -- so she gets that in her head and she resists when she graduates from high school going in and getting a job in Manhattan, much to frustration of her widowed mother who wants her to go out and get a job. So her mother runs into Mr. Fague (sp?) and who's the owner of the funeral parlor in the street and he's looking for a girl, a girl he refers to act as a consoling angel. MCDERMOTTWell, the way Mr. Fague figures it, he's a great reader of Dickens because of his name. And he's learned from "Oliver Twist" that in Dickens' times there would be child mourners, that a child dressed in mourning would lead a funeral parade. And that sort of appeals to him. So his theory is to always have an attractive young woman working in his funeral parlor, greeting the guests when they come in for the wake. MCDERMOTTTaking the coats, but also reminding the mourners of youth and life and life again. And as he says, to be reminded of life is to be reminded of the promise of resurrection. So he has great theories behind why he liked -- I think he also likes young women. And so he likes to have them around. And much to her surprise, Marie who's never been called an attractive young woman applies for the job and gets it. MCDERMOTTSo she works until she gets married and gets pregnant and has to leave. She works in Fague and Brownstone Funeral Parlor as the consoling angel, taking coats, just being there. And of course she takes her glasses off. So she also has a fuzzy sense of mourning. GJELTENAlice McDermott, her new novel is "Someone." I'm Tom Gjelten of NPR. You're listening to "The Diane Rehm Show." So you describe Marie as, I think it's fair to say, a relatively unattractive woman and yet, as you just pointed out, she does get married and she actually has a pretty happy marriage and has four children. MCDERMOTTYes. And I think a relatively happy life. The tension arises again from this first scene, from her brother proposing that we are not alone, that providence is with us, that God even knows when the sparrow falls and her sense of, really? Is that true? Is that possible? And I'm not sure that she ever answers the question but almost in advertently I think throughout the novel the answer arrives for her. And that is there's always someone nice as Pegeen proposes. GJELTENCan you generalized from this novel to your own philosophy of life? I mean, are you just telling us right now that you are inherently, intrinsically, instinctively an optimistic person? MCDERMOTTI'm not sure that I am, but I discovered in composing this novel that there's reason to be optimistic. GJELTENAnd you can make an optimistic person real and genuine. MCDERMOTTYes, yeah. Yeah. And, again, just looking for as we must do composing a novel, aiming for, dare I say, art. Looking for the connections, looking for the reason that everything is in a story. Nothing is arbitrary, even if at first glance it appears to be arbitrary. It's the writer's job to find out why is it there. And so in the course of trying to just authentically give voice to this character, I began to see that Pegeen may have been right. MCDERMOTTAnd her brother Gabe may have been right. I mean, you know, the very notion that his eye is on the sparrow should and probably does strike a contemporary reader as ridiculous, you know. No, there's too much grief, there's too much -- across the entire history of humankind, a God has been watching and knows about our suffering, knows every individual suffering. Really? MCDERMOTTAnd I think that's where that seven-year-old Marie says, you must be a fool to think that. But Gabe does and across her life perhaps it's true. GJELTENAnd Gabe was trained to be a priest. GJELTENIs what you're describing here something that sort of arises out of the Irish Catholic milieu? MCDERMOTTOh, certainly, certainly. There is that. I mean, again, she is very much part of that. Now her parents are not -- her mother right away is, although they're very proud of their son being accepted into the seminary because it's a way to get an excellent education, they're also skeptics. GJELTENAlice, your son has been interested in this story as well and we actually have a piece -- he's a musician. GJELTENI want to play something, he's got a new CD out. I want to play something like this and then we can talk about -- after the break, we can talk about how it came up. But he has a song on this new CD called "Maria's Grand Old Name." Let's listen to a little bit of this, and then after the break we're going to talk about how his song, his arrangement of this song compliments your story. GJELTENAnd welcome back. I'm Tom Gjelten sitting in for Diane Rehm. And our guest today is Alice McDermott, the novelist. Her new novel is called "Someone." She's the author of six previous novels and I know that there are a lot of Alice McDermott fans in our listening audience. And I'd love to hear from you. Our phone number is 800-433-8850, 800-433-8850. Call us and join us in this conversation. You can also email us drshow@wamu.org. You can send in your comments or questions on Facebook or Twitter as well. MCDERMOTTI do and I'm glad that bit of advice works. Whatever works for any of us is good advice to take. But I'm always cautioning my students not to write about themselves, but to write about their characters. GJELTENSo Alice, just before the break we played a lovely version of the song "Mary's a Grand Old Name" by George Cohan. And tell us a little bit about that song and how it fits into your story of Marie Commodore, the book called "Someone." MCDERMOTTThere's a scene in the novel when Marie meets Tom who will be her husband. And he's an exuberant guy but has had the experience of putting his foot in his mouth I suppose. So early on he asks her if there are any Italians in her family because he's never met an Irish girl with the name Marie. And so she explains to him that she was supposed to be Mary, which would've been more appropriate in that Irish American milieu until her mother heard the George M. Cohan song, "Mary, it's a Grand Old Name" (sic) which has the phrase "but in society propriety they'll say -- with propriety they'll say Marie." MCDERMOTTAnd her mother thinking, well society is really what she was after and propriety chooses Marie. And again, it reflects that whole parlor floor, the face we show to the world, the immigrant aspiration to be something better than we might appear to be. So that's the song that actually gave birth to the character's name. GJELTENWell, and the musical -- the song that we heard before the break was arranged by your son Will Armstrong. He played piano on that selection. How did you get your son to put together an entire CD that is titled "Music for Someone, a Novel by Alice McDermott?" That's quite a tribute from your son to do a CD based on this novel. MCDERMOTTIt was lovely. It was -- and ironically enough here he is back in Brooklyn. And Brooklyn is now an entirely different world than the one that Marie experienced, hipster Brooklyn, young people Brooklyn. As a friend of mine once mentioned -- I said that I was visiting and I was there after 1:00 in the morning and a friend of mine said, I think in Brooklyn if you're over 40 you're escorted to the Queens border after midnight. And there's very much that feel to it. Now certainly not what Marie would have experienced. MCDERMOTTSo in this -- just this past spring he called me and he was going into the studio with some friend, Andrea Wood, who's beautiful voice you heard -- one of them. He's going into the studio with some friends to put a CD together. And he was looking for some new tunes, old tune, maybe not just the typical jazz standards, to do his own arrangements for. And he said, are there any songs mentioned in your new book? And so, well, certainly I said "Mary, It's a Grand Old Name" (sic) is there. "The Anniversary Song" is there and then a traditional Irish song "Believe Me, If All Those Endearing Young Charms." MCDERMOTTAnd he said, okay well, as a Mother's Day present I'm going to make an arrangement -- I'll do a jazz arrangements of those and we'll put them on the CD. And then he sort of got into it and then he did some original compositions based on lines from the book. And then he took some other traditional Irish tunes and did some arrangements for it. And before he left the studio he had a soundtrack, so to speak, for the novel. GJELTENSo was it originally supposed to be just something private made by him for you? MCDERMOTTYes. Yeah, yeah, it was, you know, just a demo CD as, you know, musicians trying to make their way in New York will do to get gigs. Yeah, so he had a lot of fun with it. And when I mentioned it to Farrar, Straus, they were delighted to do a special edition. GJELTENWell, it's a lovely CD. And I want to read you this email that we got from Carol Ann. She says, "I remember specifically how the character in that novel" -- she's talking about Marie -- "I was also somewhat odd about going up to Manhattan. I was raised in Brooklyn and Manhattan was something awesome, a place to live, to work and to go to a movie or a show. My generation growing up in the '50s, we all wanted to live in the city when we were adults. And of course working in Manhattan always seemed so sophisticated." GJELTENSo Carol Ann was sort of raised with this idea of Manhattan as being this, you know, very glamorous place. Marie is not quite so sure what to make of it, at least under the influence of Pageen. MCDERMOTTYes. And, again, this was this new immigrant generation who loved the place. You know, that sense of -- very American sense that these were the children of parents who had left somewhere else, whether they were Italian or Syrian as Pageen's father is, you know, the host -- the United Nation's host who came, so that Brooklyn is the best place. Because this is the place they've come to. So again there's this, I think, very much of the era small town mentality of, we have traveled far to get here. And there's no better place. MCDERMOTTWhen Marie's mother is dying, her fear is that every time she goes to sleep she wakes up and she says, am I home, meaning Ireland? And she doesn't want to be there. And her children have to say, no, you're not home. You're in Brooklyn, which is a reassurance. GJELTENLet's go now to Mark who's on the line from St. Louis, Mo. Mark, are you a fan of Alice McDermott's novels? MARKOh, big fan, especially "Charming Billy." Alice, I've wanted to ask this question for a long time. The Roman Catholic Church played such a large role in your writing as a background figure and as a source of, you know, creative material at any rate. But I saw at the time that you won the prize for "Charming Billy" you mentioned having a certain affection for the ancient Latin Mass. So I thought I would ask you, not just as a creative person and a writer, but as a human being with children, what is your relationship to that institution now? MCDERMOTTWell, I am I guess what they call a practicing Catholic. I still practice, haven't quite gotten it right yet. Not ready for my debut but I am still practicing. The church -- I love the church. It is -- it's given me a language. It's given me a way to look at the world. It is part of my DNA. I am angry and frustrated by it often. But I think that's true of most things we love. I don't expect perfection from my church or any church. And I don't think I'd want to be a part of any church that claimed to be perfect. But I'm still working at it. MCDERMOTTI haven't quite abandoned it yet, as so many of peers have done but I think there is a truth in it that I'm still hoping to unpack and discover. But it's also been a great gift in my life and it continues to be. GJELTENWell, as we said earlier, Marie's brother Gabe was training for the priesthood and then ultimately decides not to become a priest. He's a pretty important character in this book. Tell us a little bit about him and what the church and the prospect of becoming a priest meant to him and why he is important in this story. MCDERMOTTYeah, very much, and again in contrast to Marie, the golden boy. He recites poetry to his parents' delight. Again, he's accepted into the seminary at a young age, which means definitely a way out, their society and propriety in its finest form to Irish Catholics. He goes off to the seminary and is ordained. But when Marie's father dies and Marie's mother is widowed, Marie and her mother are alone, he returns with very little explanation, only to say that it wasn't for him. MCDERMOTTAnd he remains in the apartment in Brooklyn and there as a kind of caretaker. As we mentioned, he's there when Marie has her first heartache. He reads -- he's mysterious and wonderful because he reads. He spends time alone with books. But eventually as Marie moves on into her life and marries and move out into the suburbs, Gabe does experience a heart-breaking breakdown. And Marie is there for him. And in the end -- in the final section of the book, it's Marie who's the someone who's always nice for her brother and is there. MCDERMOTTAnd in some ways the argument can be made -- and I won't get it -- I won't tell you too specifically, but the argument can be made that she does indeed at some point save his life. So again, there is the reoccurring metaphor of, you know, is there providence? Is there someone who's eye is on the sparrow? And is that someone each of us for one another? GJELTENHe was clearly a very inspiring figure to her but, again, after this breakdown experience she has to see him as a real man or real person. And you write in Marie's voice, "And now my heart failed to think that the holy mystery of who my brother was might be made flesh -- ordinary flesh by the notion that he was simply a certain type of man." MCDERMOTTOf course. The bachelor failed priest uncle, clearly he must be gay. That's -- and, you know, certainly an argument can be made, that's probably very true. And again, this is where I had to be very careful as the writer not to bring present-ism in that and to understand what it would have been -- what it would have meant to be a gay man in this society at this time. And that might not have been the first answer that he or even his peers would have given to his unhappiness or dilemma. GJELTENAlice McDermott. I'm Tom Gjelten of NPR. You're listening to "The Diane Rehm Show." And let's go back to the phones now. Jeannie is on the line from Silver Spring, Md. Good morning, Jeannie. Thanks for calling. JEANNIEGood morning. I'm sorry I didn't hear the whole thing. I actually just tuned in about ten minutes ago so I only have a general idea of the book. But when you hear a book about Irish immigrants in Brooklyn, the one that comes to mind immediately is "A Tree Grows in Brooklyn." And I'd be interested, if you haven't already covered it, to hear if that influenced you. GJELTENShe hasn't covered it, Jeannie, so good question. MCDERMOTTNo. Well, of course as a young reader, "A Tree Grows in Brooklyn" was a favorite book of mine. I absolutely loved it, as many people do. It's a great story. And early on in my career, writing about Irish Americans, especially in the New York City area, I remember thinking very carefully, I sure as hell don't want to write another "A Tree Grows in Brooklyn." MCDERMOTTThis book was not influenced except in the way that everything any writer has ever read influences how that writer writes, but no way a conscious duplication or even homage to that wonderful novel. This is a much more interior tale and it's about much more than a childhood. GJELTENAnd let's go now to Ann who's on the line from Baltimore, Md. Good morning, Ann. Thanks for calling "The Diane Rehm Show." ANNGood morning. Thanks for taking my call. I just wanted to say that anybody who writes a novel about an Irish Catholic family in Brooklyn is never going to write a novel that's boring or uneventful. I grew up in Brooklyn. My mother was going through a difficult marriage and she used to dump me at my grandmother's house in Brooklyn. And I do want to make one other point -- well, actually two. ANNMy name is Ann because my father wanted to name me Annie. We were all Irish Catholic and my mother said, no, no, that sounds like an Irish scrub woman. So I am Ann, yes. And my Nanna used to take me across Flatbush Avenue into the park where she would smell flowers and pinch them off and put them in her pocketbook. GJELTENSo Ann, you remember -- obviously you remember a lot of things from your own childhood just as Alice does from what she heard from her parents. This was a pretty important place to grow up for you, I guess, Ann. ANNOh, and the Irish are storytellers so, yes. MCDERMOTTI always say that the convenience of writing about Irish Americans is that we all more or less have had the same life. So there's lots of identification. GJELTENAlice, it's been how many years, seven years, since your last novel? GJELTENThat's a long time, too. MCDERMOTTVery long, yes. Big change. The publicity people at my publisher were talking to me about platforms. And last time I had a book come out, platforms were shoes. So, yes, things have changed very rapidly. GJELTENOkay. All right. I understand you're working on another novel right now. GJELTENAnd what's your new novel about? MCDERMOTTThis is a more complex story I suppose. It's still in the composition phase so anything can happen. But it's about a group of friends and extended family and a little bit historical and on another level much more contemporary. GJELTENWell, friends and community and caring for each other seems to be a recurring theme in your book. We're looking forward to that novel. And we're going to enjoy this one. My guest this hour has been Alice McDermott. Her new novel is called, "Someone." She's the author of six previous novels including "After This," "Child of My Heart," "Charming Billy," which won the 1998 National Book Award, "At Weddings and Wakes." There we go again with that funeral parlor image. MCDERMOTTJust can't get away from it. GJELTEN"That Night" and "A Bigamist's Daughter." And she has also inspired her son, Will Armstrong, to produce a CD based on the characters and themes of this book "Someone." We heard a little bit from that earlier today. Thank you so much for coming in, Alice. It's been a great conversation. GJELTENI'm Tom Gjelten sitting in for Diane Rehm. Thanks for listening.